Is a BBC WS claim about Israeli politicians true? The August 16th edition of the BBC World Service programme ‘Newshour‘ included an item (from 48:53 here) in which the BBC managed to shoehorn Israel into its coverage of last weekend’s shocking incidents in Virginia, USA. “Video of the white supremacists in Charlottesville clearly shows them chanting openly antisemitic slogans, with organisers amongst other things complaining that President Trump allowed his daughter to marry a Jewish man. The issue of whether or not it is appropriate for politicians from any country to comment on the internal affairs of another state is not discussed in this item and listeners are not given an answer to the question of why Bennett-Jones singled out Israeli politicians rather than those in any other nation. But is the claim regarding Israeli politicians made by Bennett-Jones accurate? Earlier on the same day that this item was broadcast, the Times of Israel published an article titled “Israeli politicians reject Trump claim of two sides to Virginia hate march“. ““There aren’t two sides,” Yair Lapid, head of the centrist Yesh Atid party, said in a Wednesday statement. Tzipi Livni, a former justice minister and No. 2 in the opposition Zionist Union faction, also rejected Trump’s assertion. …Justice Minister Ayelet Shaked […] urged that the neo-Nazis face prosecution. In addition to those decidedly not “muted” statements, the Israeli prime minister put out a tweet condemning the racism and, despite members of the Knesset currently being on holiday, a number of other politicians from a range of parties likewise made their views on the matter clear – including Michael Oren, Zahava Galon, Revital Swid, Ksenia Svetlova, Manuel Trachtenburg, Avi Gabbai, Yehuda Glick, Yitzhak Herzog, Dov Hanin, Shelly Yechimovich, Amir Peretz, Meirav Michaeli, Ayelet Nachmias-Verbin, Miki Rosental, Nachman Shai, Itzik Shmuli and Tamar Zandberg – who even went on American TV two days before this ‘Newshour’ programme was aired to talk about the issue. And yet, the BBC apparently came to the bizarre conclusion that it was accurate to describe the responses from those Israeli politicians and others as “muted”. Seeing as in the past the BBC has on countless occasions failed to comply with its own editorial guidelines on impartiality by refraining from clarifying the “particular viewpoint” of interviewees, that detailed introduction is noteworthy. We have on many occasions documented the use of imprecise language in BBC reports which results in audiences being given inaccurate impressions of construction in Judea & Samaria and parts of Jerusalem. Last September the BBC News website corrected one such article but the phenomenon remains widespread. “…Israel’s prime minister has announced that he plans to establish a new settlement in the West Bank for the first time in more than two decades. Clearly then the BBC understands that there is a significant difference between the construction of houses in existing communities and the establishment (so far not even on paper) of a “new settlement”. Nevertheless, the day before that announcement was made, listeners to the February 1st edition of the BBC World Service programme ‘Newshour’ heard Owen Bennett Jones use the inaccurate term “new settlements” to describe the announcement of building in existing communities (from 50:22 here). It really should not be difficult for the BBC to ensure that its journalists are aware of the difference between construction in existing neighbourhoods, towns and villages and “new settlements” and that they use precise language to describe the story they are reporting in order to prevent audiences from repeatedly going away with inaccurate impressions. In part one of this post we discussed the earlier section of Tim Franks’ report from the Gaza Strip which was broadcast on the BBC World Service radio programme ‘Newshour’ on February 1st (from 14:07 here) as part of a multi-part special feature. A section of the report – including the baseless accusation of “collective punishment” – was later promoted separately by the BBC World Service on social media. Following a sketchy portrayal of the electricity crisis in the Gaza Strip and the related demonstrations which took place last month, Franks went on to interview Hamas’ Ghazi Hamad. Listeners then heard a statement from Hamas which is identical to the messaging they have been hearing from the BBC for weeks: the notion that Israeli building is the prime obstacle to the two-state solution. Of course Hamas rejects the concept of the two-state solution outright, but Franks chose not to challenge Ghazi Hamad on that point. Franks is referring to the terror attack in Har Nof in November 2014 which resulted in the deaths of six Israelis and about which the BBC found it appropriate to interview Ghazi Hamad at the time. Franks’ subsequent interview with web developer Rana al-Qirnawi can be heard from 45:08 here. Following that, listeners heard a conversation between Franks and programme presenter Owen Bennett Jones which included promotion of the debatable notion that people are radicalised by difficult conditions. Franks’ answer to that question reveals that he knows full well that Hamas is opposed to the two-state solution or any other kind of peace agreement with Israel – which of course begs the question why that crucial point is not sufficiently prominent in both his own reporting and the broader coverage by the organisation he represents. Franks: “Well I’m… you know, these are the views in terms of this programme from Gaza. We’ve looked at Jerusalem earlier in the week. We’re going elsewhere later in the week. But in terms of Gaza the truth is, Owen – I mean yes; that was the starting point for this project – no-one’s really talking about it here. They haven’t been talking about it for years and it’s partly because there’s no real incentive to talk about it…ah…in public or with a journalist. After all, the official Hamas position is that in the long-term there’s no place for a Jewish state in the land of Palestine. But there’s a more immediate point I think…ahm…which is that, you know, the people here have far more direct concerns. It’s about the next meal, when is the power going to go off, how do you make money, what’s the water supply like – answer: not terribly good. So it’s those sort of much more quotidian dreary concerns that are driving people rather than any grand thoughts about a solution to all of this. It is of course quite remarkable that a journalist could produce such a lengthy report (nearly 14 minutes long in total) from the Gaza Strip – especially one which purports to “assess the viability of the two-state solution” and includes an interview with a representative of Hamas – without uttering the word terrorism even once, without informing audiences of Hamas’ efforts to rehabilitate its military capabilities – including cross-border attack tunnels – and without mentioning the fact that it is those priorities which play a significant role in creating the difficult conditions for the residents of the Gaza Strip which he does report widely. Tim Franks, however, managed to do just that. The BBC World Service ‘Newshour’ special feature that began on January 30th with Tim Franks producing a long report from Jerusalem (see ‘related articles’ below) continued on February 1st with – as promised – a report from the Gaza Strip. Oddly, Franks’ scene-setting did not include informing his listeners that Israel disengaged from the Gaza Strip well over eleven years ago or that the “scalding violence” he described is inevitably the outcome of the continuing terror attacks against Israeli civilians, including thousands of missile attacks launched since that disengagement. Franks then proceeded to a topic which has been covered – albeit very superficially – by the BBC on several occasions in the past. Franks: “You hear that? That’s the sound of Gaza by night: generators thumping and groaning away. The electricity at the moment, it only runs for eight hours a day: eight hours on, eight hours off. Pity the factory manager, the café owner. Hamam Aliaji [phonetic] is both: he bottles Pepsi by day, runs his coffee shop by night. Not easy. Yet again we see that the BBC avoids telling its audiences that the real reason for the perpetual electricity shortage in the Gaza Strip is a long-running disagreement between the Palestinian Authority and Hamas over the payment of excise taxes for the fuel that is used in the power station in Gaza. So while listeners were encouraged to “pity” the residents of the Gaza Strip, they were not informed of the background to their plight, just as they were subsequently not informed that the reason why many buildings there have not repaired is because of Hamas’ hijacking of construction materials for the purpose of terrorism. Franks went on to present a caricature portrayal of the restrictions on the import of dual-purpose goods into Gaza while failing to adequately inform listeners of the terrorism that makes them necessary, playing the “Israel says” card and even amplifying the baseless accusation of “collective punishment”. He also failed to inform listeners of a factor long under-reported by the BBC: Hamas’ collaboration with ISIS terrorists in the Sinai Peninsula. However, listeners who at this point assumed that they were going to get some information on the serially under-reported topic of Hamas’ repression of opposition to its regime in Franks’ interview with BBC regular Ghazi Hamad would have been disappointed – as we will see in part two of this post. As documented here previously (see ‘related articles’ below), the BBC News website’s portrayal of the report published by the Quartet on July 1st was far from satisfactory and failed to provide audiences with a balanced picture of its content. In this post we will take a look at how the same report was presented to listeners to BBC World Service radio in the July 1st edition of ‘Newshour’ – from 30:08 here. In its discussion of the first factor on that list, the report was remarkable for its forthright condemnation of incitement and glorification of terror by official Palestinian bodies including Mahmoud Abbas’ party Fatah and the PA itself. Those topics have long been neglected by the BBC and were once again sidelined in the two articles which appeared on the BBC News website. Sadly, listeners who heard Owen Bennett Jones’ introduction to the ‘Newshour’ item did not learn of the Quartet’s condemnation of incitement from official Palestinian bodies because he referred generally to “the Palestinians”. Listeners did however hear the erroneous claim that Israel is “building settlements” rather than building in existing communities. A few hours before this programme went on air a fatal terror attack had taken place on Route 60. The closure on Hebron was implemented as security forces searched for the terrorists but uninformed listeners would have had difficulty understanding that connection from Yolande Knell’s reply to Bennett Jones’ clear question. Knell did not clarify for her listeners why the close of Ramadan might bring about “a rise in violence” or inform them that during that month alone six Israelis had been murdered in terror attacks by the time she produced this report. Owen Bennett Jones then asked Knell another clear question which she failed to answer. Obviously Knell was either unable or unwilling to answer the question of “how frequent are the attacks […] against Israelis” in Judea & Samaria and given that the BBC consistently under-reports the topic of Palestinian terror, that is hardly surprising. While Knell is correct in her claim that the number of attacks had been decreasing up until June, the fact is that according to Israel Security Agency figures, between October 2015 and June 2016 inclusive, 1,471 terror attacks took place in Judea & Samaria: an average of 163.4 attacks per month or 5.4 attacks per day. One would of course expect a BBC correspondent permanently based in the area to be able to report that information to audiences. Bennett Jones continued, once again promoting the inaccurate notion that Israel is building ‘settlements’ rather than constructing housing in existing communities. The item ends there and as we see, once again BBC audiences have had their attentions focused on ‘settlements’ – described by Knell as an “obstacle to peace” – but have learned nothing about the much neglected subjects of incitement from official Palestinian sources as highlighted in the Quartet report and nothing about its condemnation of Hamas terror, tunnel building and arms smuggling. This is the BBC’s third attempt to ostensibly inform its audiences what was in the Quartet report and it is the third time that it has refrained from doing so comprehensively, accurately and impartially. Obviously the way in which BBC audiences view the failure to achieve a peaceful solution to the conflict will be influenced by these reports, with the fact that the BBC has airbrushed Hamas and Palestinian Authority related factors from the picture sabotaging audiences’ chances of properly understanding of the issue. Listeners to the May 6th edition of the BBC World Service programme ‘Newshour’ (from 14:04 here) heard Owen Bennett Jones make the following introduction to an item about Hamas mortar attacks on Israeli soldiers operating near the border with the Gaza Strip. Context to that story would obviously cover the fact that Hamas is a designated terror organization which took control of the Gaza Strip in a violent coup. It would also include clarification of the fact that, despite Israel’s disengagement from the Gaza Strip over a decade ago, Hamas continues its terrorist activities because its ultimate goal – as laid out in its charter – is to destroy that neighbouring country. Context would also provide information concerning Hamas’ efforts to rebuild its terrorist infrastructure since the end of the 2014 conflict – not least its misappropriation of construction materials intended for the repair and rebuilding of civilian homes for the reconstruction of its network of cross-border attack tunnels. ‘Newshour’ listeners, however, got none of that relevant context from Kevin Connolly who presented a myopic view of the issue of a terrorist organization tunnelling into the territory of a sovereign country. What followed was a repeat of the audio report by Jeremy Bowen broadcast two days earlier on BBC Radio 4 and, remarkably, Bennett Jones’ introduction included language identical to that used by the ‘Today’ presenter. As has been pointed out here on numerous occasions in the past, the promotion of that mantra is problematic as far as the BBC’s supposed commitment to impartial reporting is concerned because it does not inform audiences of the existence of expert legal opinions which dissent from the narrative adopted and amplified by the BBC. Now we see – twice in two days – that the BBC has even abandoned the “Israel disputes this” part of that mantra and is promoting messaging which materially misleads audiences by blinkering them to the existence of debate around interpretation of Article 49 of the Fourth Geneva Convention. That is clearly not consistent with the BBC’s supposed commitment to editorial impartiality. 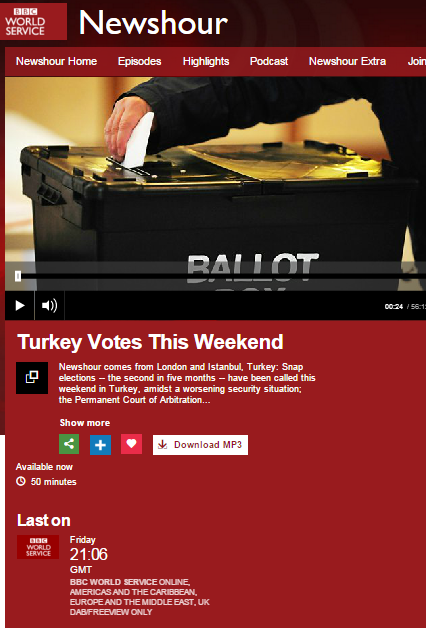 In addition to the filmed report from Hebron shown on BBC television news programmes on October 30th, Yolande Knell also produced a similar audio report which was broadcast on the BBC World Service radio programme ‘Newshour’ (available here from 37:15). Like the filmed version, that audio report promotes the notion that Israelis living in Hebron are ‘illegal settlers’ – despite the signing of the 1997 “Protocol Concerning the Redeployment in Hebron” by Palestinian representatives. It is of course Knell’s failure to clarify to listeners that the existing arrangements in Hebron are the result of an agreement between Israel and the PLO which allows her to promote the politically motivated narrative of an “occupied part of Hebron”. That narrative is also advanced by her interviewee Issa Amro, who is once again inadequately introduced as “a local activist”, with no effort made to comply to BBC editorial guidelines on impartiality by clarifying his political affiliations and agenda. In common with the filmed item, Knell’s radio report is notable for the fact that it too provides backwind for the Palestinian propaganda seen in recent weeks which attempts to portray terrorists as ‘innocent victims’. Saad al Atrash is “said to have tried to stab an Israeli soldier” because that is exactly what he did on October 26th – but those listening to Knell’s account would not be sure of that. The same theme is also promoted by host Owen Bennett-Jones in both his introduction and closing remarks, providing an opportunity to examine what the BBC sees fit to describe as “alleged” and what it is comfortable portraying as fact. The death of a baby, supposedly due to tear gas inhalation, is presented to BBC audiences as fact even though investigation showed that claim from the Palestinian Authority’s Ministry of Health to be unfounded and Palestinian doctors dismissed the claim, saying that the infant had an existing health problem which was described by relatives as a birth defect. An attack in Jerusalem in which a man was moderately wounded by a terrorist with a knife is presented to listeners as an attempted attack. An incident at Tapuach Junction in which two Palestinians arrived at the scene on a motorbike and then approached a Border Police officer whilst wielding knives is portrayed as ‘alleged’. This narrative-driven selective framing is obviously not conducive to meeting the BBC’s professed standards of accuracy and impartiality and does not contribute to meeting its remit of enhancing audience understanding of the story.